I love this dish and there are many short cuts to making this even easier. Juice the lemons and limes and add the juice to a large bowl. (You don’t have to use fresh lemons and limes if you can not find them. You can use the containers of just the juice found in the produce section of you local grocer.) Add the bitter orange juice also to the bowl. If you can not find bitter oranges Goya makes a bottle of Bitter Orange Juice that will work as well. If you use the bottle juice use only 3 cap fulls. Take half of a large Red Onion and slice it so the slices are no longer than an inch and as thin as you can get them. Add the Kosher Salt, Pepper, Paprika or Cayenne Pepper if you like it spicy, Cilantro, sugar, and EVOO. Combine all ingredients and make sure that the shrimp is completely submerged in the juices. Let this sit in the the refrigerator for at least 3-4 hours. Check after that to make sure the shrimp has turned to it’s beautiful coral color. If some pieces are still raw let it sit longer. I personally like to leave it overnight so that all the juices are settled in and the flavor has completely absorbed. 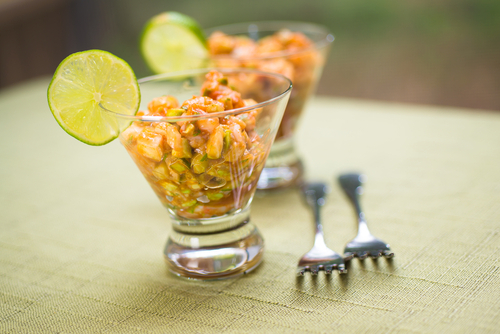 Serve with Plantain chips or alone in a Martini Glass for decoration. You can add tomatoes to the bowl as well.